The exterior redwood siding had been painted to cut down on maintenance—the canyon is in a marine climate that is super tough on wood, Alex says—and much of the interior was painted white, so he used several approaches. The diamond backsplash and Silestone counters are new, as are Julien sinks. 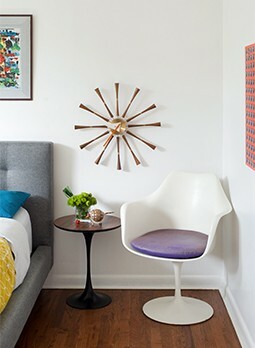 Where a longer pullout table for family dining stood, the home- owners opted for a shorter, laminate-topped version that’s a good catch-all for shopping bags and keys. “The Paintshaver Pro has triangular carbide blades that spin and you can set it to remove the top 1/16″ of paint, barely touching the wood. If any of your paint is lead, you can hook it up to a HEPA vac,” he explains. “On a house like this, you have to presume all of the paint is lead-based. I rented a leadpaint X-ray gun for $350, and spent a day gunning every surface and recording the readings on Post-it notes. If it’s 1.0 mg, you need to get a professional remediator; under that, you can use wet removal. 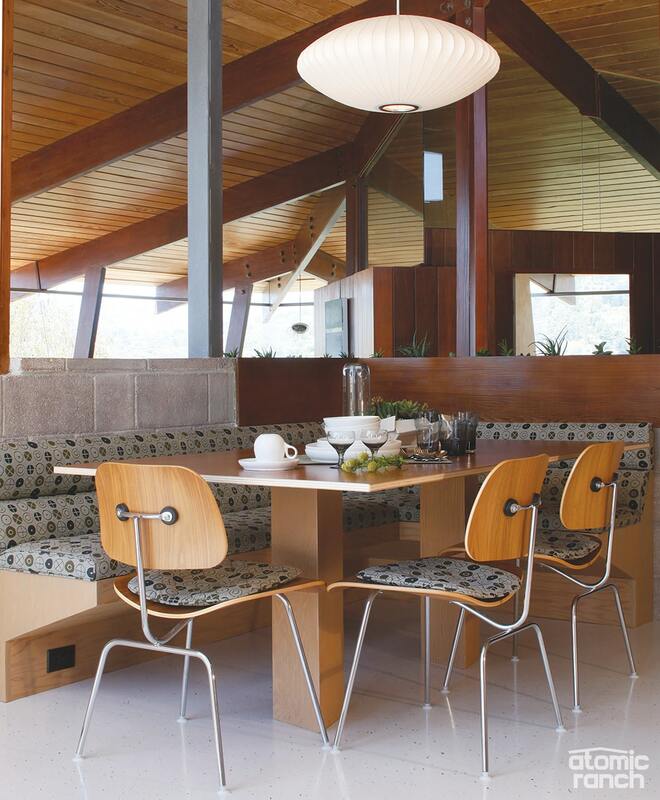 The banquette benches and Eames DCMs are upholstered in Eames Circles Document fabric. Overhead, the Doug fir support beams have steel flitch plates for strength, and a Nelson bubble lamp provides illumination. The cabinets were repaired, stripped and refinished, and Silestone counters and Armstrong vinyl flooring installed. Kozlowski found a source for replacement diamond-patterned stainless steel backsplash material, and requested a banquette for the adjoining dining area. 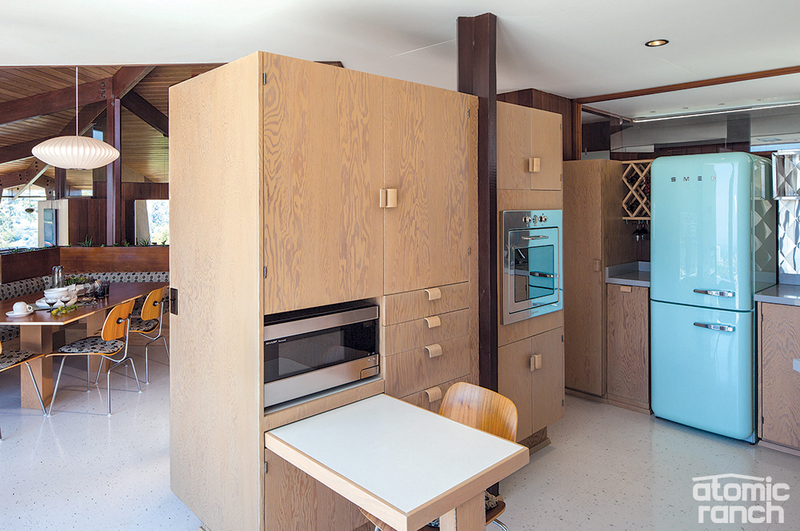 New Smeg appliances replace the original Thermador cooktop and an ’80s oven and refrigerator. The pursuit of period perfection continues to other parts of the house. Read on in part 3 to discover how Alex and Kristin find another kindred spirit to join the team.